We were sitting in the booth of a local coffee shop– just my second son and I–sipping our hot morning drinks, killing some time before I dropped him off at a day-long, Boy Scout service project. We were at one of my favorite coffee houses in Roanoke, filled always with eclectic art and eclectic people. 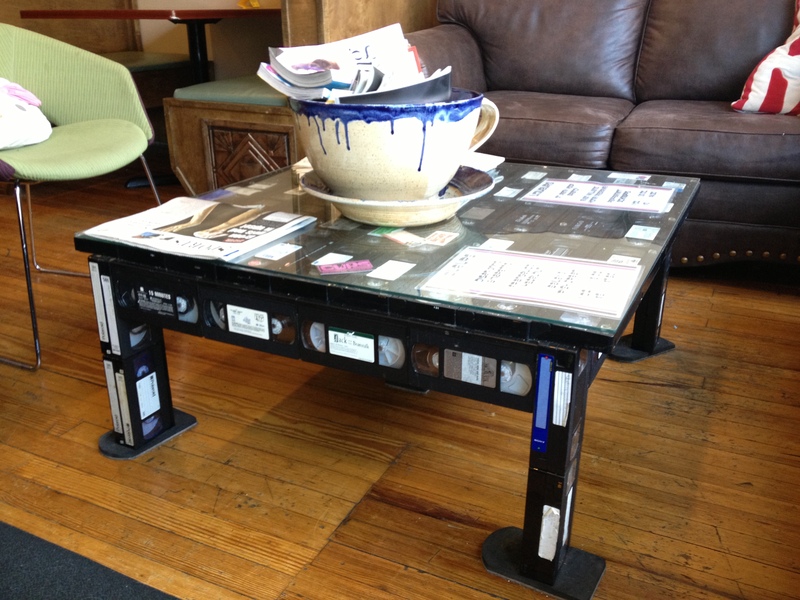 “Hey, Buddy, do you know what those are?” I asked, pointing to a coffee table made of old VHS tapes. He turned in his vinyl seat and looked only slightly confused before answering. I giggled and corrected him. We chatted for a bit about how we thought the tapes were stuck together solid enough as to stand as a table since thin plastic and rolled film don’t exactly take to a hammer and nails. Then Second Son mentioned that he remembers watching movies on VHS in our home when he was little, though he couldn’t quite remember which movies they were or how long ago it was. For some reason, though I know we have several movies still on VHS, I could only think of a little animated Christmas movie passed down to me by my granny: The Little Troll Prince. It is the story of a troll prince who doesn’t really fit in with his cranky troll community. Like the dentist elf in Rudolf, this little guy isn’t troll-ish enough for the rest of his family and friends and ends up ostracized from his home. He makes his way down the mountain and happens upon a woodsman and his daughters chopping down a tree for Christmas (I think he is actually in the tree they chop down). The family embraces the little troll and shares the true meaning of Christmas. The little troll then becomes a gnome and lives like St. Francis caring for all the birds and beasts of the forest. I remember watching it as a child every year at Granny’s house during Christmas time. She kept the movie in its own special case and had her name printed neatly on the tape’s label—Joyce Bell—in black Sharpie marker just above the movie’s title. Somehow the movie was passed on to our family and every Christmas I continued to make time for it, though it seemed I should have been too old for amateurish cartoons made so overtly to share the Gospel message. Then I had children and somehow, again, the movie was passed on to my family; still in its special brown protective case, still with my granny’s name—Joyce Bell—printed on the label. I would sit with my busy boys cradled in my lap and watch with them the story of a little troll changed by the message of a Savior into the forest gnome he was always meant to be. Somewhere in my reminiscing, I realized how careful my granny was with that VHS tape. By the time she bought The Little Troll Prince, she and my papa were living the most comfortably they had ever before in their lives—which is to say, they had enough money to do a little more than make ends meet. And with their little more, Granny bought things like Hallmark ornaments for all her grandchildren, pretty paper on which to write me letters, and—eventually, when they splurged on a VHS player—precious few VHS movies for her grandchildren to enjoy while visiting. Every splurge was cared for as a precious gift to enjoy, but equally important, a trust to keep well. I mentioned this to my son as he played with the whipped cream topping on top his hot cocoa, slicing into it with his spoon. We compared Granny’s white glove care of that old VHS tape to our own DVD spending and caring-for habits. It made us both squirm in our vinyl-covered seats. Second Son looked at me with slight sheepishness in his enormous brown eyes and smiled, embarrassed. I chuckled at his memory. We gave the old VHS coffee table another admiring glance, then finished our drinks so as to not be late to the service project. Our conversation came to an end, but my soul was filled with the richness of blessing: blessing of my grandmother’s generational love passed on through a VHS tape. Hi! I stumbled across your blog tonight. It’s good to see you on here. Love your stories and pictures! Wow, Kristen! I think that is pretty crazy that you found my blog! Your family looks beautiful and growing!! Please keep checking in with me 🙂 I love that we have reconnected!